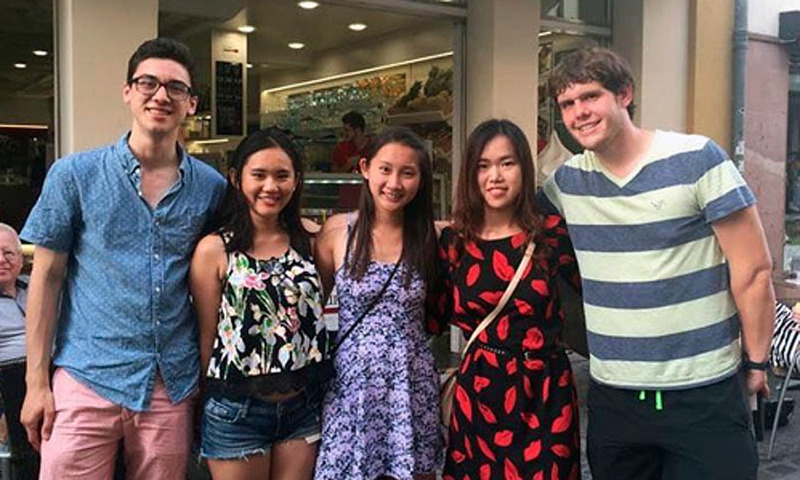 "I got to learn something new every day"
Florence Yip, center, with other DAAD-Rise scholars in Germany this summer. Florence Yip ’17 of Mechanical Engineering thought research was all about spending time in a lab. Now she knows there’s a lot more involved, after spending this summer as a DAAD-RISE scholar at Friedrich Schiller University’s Otto Schott Institute of Materials Research in Jena, Germany. The program pairs up undergraduate students from the US, Canada, and UK with German doctoral students to work on a research project for 8–12 weeks during the summer. “I got to learn something new every day,” Florence said. Florence studied the mechanical properties of carbon fiber reinforced composites, which involved preparing different test samples, carrying out finite element (FEM) simulations, and programming. Her work in the lab mainly involved producing various types of composites using carbon fibers and chemicals, and taking microscopic pictures of the samples. Read more in Florence’s blog posts for the Office of Admissions.